Enviar una exposición de motivos de una cuartilla adjunta al curriculum resumido. Las personas aceptadas recibirán un correo con la dirección en la que podrán descargar las lecturas asignadas, a partir del 8 de abril de 2013. 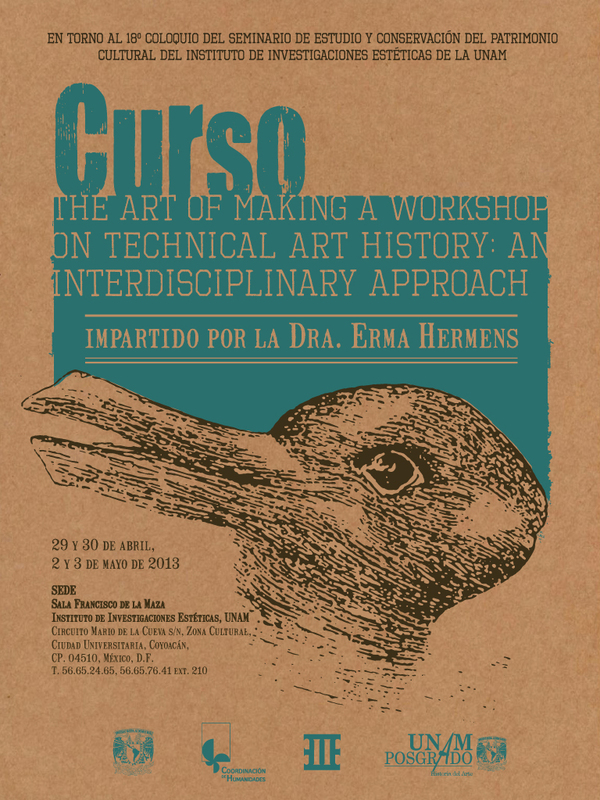 Erma Hermens, ‘Technical Art History: A Synergy of Art, Conservation and Science’, in T. Lenain, H. Locher, A. Pinotti, M. Rampley, C. Schoell-Glass, K. Zijlmans (eds. ), Art History and Visual Studies in Europe. A Handbook, Leiden: Brill Publishers, 2012, pp. 151-166. (Pdf). Interdisciplinary collaboration, some case studies. - A copy after Raphael’s Entombment: identification, function and status in early 17th-century Italy (collaboration with the Hunterian Art Gallery, National Gallery, London). This is ongoing research and the lecture/seminar will look into aspects of copying, specific scientific analyses etc. • Erma Hermens and Greta Koppel, ‘Copying for the art market in16th-century Antwerp: A tale of Bosch and Bruegel’, in Erma Hermens (ed. ), Tracing Bosch and Bruegel: Four Paintings under Magnification, Archetype Publications, London, 2012, pp. 81-95. • Anne Haack-Christensen, Erma Hermens, Alar Nurske, Hannah Tempest, Polly Smith, Jørgen Wadum, ‘Christ Driving the Traders from the Temple: Painting materials and techniques in the context of 16th-century Antwerp studio practice’, in Erma Hermens (ed. ), On the Trail of Bosch and Bruegel: Four Paintings under Magnification, Archetype Publications, London, 2012, pp. 23-44. J. Dik, E. Hermens, R.A. Peschar, R.Â and H. Schenk, ‘ Early Production Recipes for Lead Antimonate Yellow in Italian Art’, Archaeometry, 47 (3) 2005. pp. 593-607. Arie Wallert , ‘Reading technical sources’. In Art of the Past: Sources and Reconstructions, Mark Clarke, Joyce H. Townsend, Ad Stijnman (eds), Proceedings of the ATSR study group meeting, Archetype, London 2005: 39-43. Lisa Wagner, ‘Fine art materials in Vigani’s cabinet (1704) at Queens’ College, Cambridge’. E.Hermens and J. Townsend (eds), Sources and Serendipity, ATSR Proceedings, Archetype London 2009: 79-86. 2. Images of the studio: Reconstructing Antwerp studio practice in the early 17th century through Jan Brueghel’s Lady Pictura painting Flowers. S. Bucklow, Impossible Receipes, in E.Hermens and J. Townsend, Sources and Serendipity, ATSR Proceedings, Archetype, London 2009. Leslie Carlyle and Maartje Witlox, ‘Historically accurate reconstructions of artist's oil painting materials’. In Art of the Past: Sources and Reconstructions, Mark Clarke, Joyce H. Townsend, Ad Stijnman (eds), ATSR Proceedings, Archetype, London 2005: 53-59. Jo Kirby, ‘The reconstruction of late 19th century French red lake pigments. In Art of the Past: Sources and Reconstructions, Mark Clarke, Joyce H. Townsend, Ad Stijnman (eds), ATSR Proceedings, Archetype, London 2005: 69-77. Joris Dik, Erma Hermens, Rene Peschar, and Henk Schenk, ‘Early Production Recipes for Lead Antimonate Yellow in Italian Art’, Archaeometry, vol. 47 (3), 2005: 593-607. Netherlandish Painting of the Golden Age tends to be extremely systematic with, of course, some interesting exceptions such as Rembrandt. This session will look at systems and idiosyncrasies. Erma Hermens, ‘The Passion in Paint: A Technical Investigation’. In P. Black with E. Hermens, Rembrandt and the Passion, Prestel, London/Munich/New York, 2012, pp. 101-130. The Hunterian Art Gallery, University of Glasgow, has the 2nd largest collection of works by the American painter James McNeill Whistler in the world, which provides us excellent access to a lot of interesting works. Several research projects (some ongoing), methodology used, research objectives etc. will be discussed. • Erma Hermens and Arie Wallert, ‘James McNeill Whistler, fluidity, finish and accident’, in Marika Spring (ed. ), Studying Old Master Paintings - Technology and Practice: The National Gallery Technical Bulletin 30th Anniversary Conference, 16th – 18th September 2009, proceedings. Archetype Publications: London, 2011, pp. 229-236. • Erma Hermens and Margaret MacDonald, ‘En plein soleil: Whistler, Nature and Memory’, in: E. Hermens & J. H. Townsend eds., Study and Serendipity: Testimonies on Artist’s Practice, Postprints 3rd ATSR Symposium, University of Glasgow, Archetype Publications, London, 2009, pp. 112-119. A seminar on ongoing work at the University of Glasgow with opportunity to discuss ongoing projects at UNAM, brain storm on joint research etc. Curso. The Art of Making. 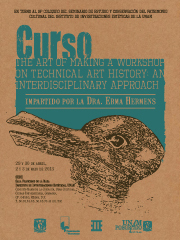 A Workshop on Technical Art History: an Interdisciplinary approach.